Recently, a well-known local high school coach made the news with the announcement that he had been admitted to a hospital for treatment of viral meningitis. Thankfully, other than feeling very miserable for awhile, he has had a full recovery. So just what is meningitis? It is an inflammation of the meninges which is the membrane that surrounds the brain and spinal cord. It is usually caused by an infection from a virus or from bacteria. Although not very contagious, meningitis can be spread by very close contact with someone who has meningitis. It is spread via respiratory droplets from sneezing or coughing or in the case of young children, the germs can be passed through the stool. Viral meningitis is the more common of the two and is the less serious one. It rarely has any complications. It is treated by taking care of the symptoms either at home or, if necessary, in the hospital. Bacterial meningitis, on the other hand, can only be treated in the hospital with an intravenous antibiotic. If not treated, or if treated too late, this bacterial infection can lead to brain damage or, rarely, death. Of the two, bacterial meningitis is the more serious infection. Meningitis is most often caused by germs from a cold or sinus infection, but can also be caused by germs that have entered the blood stream from other areas of the body. As with most contagious diseases, the best ways to lessen the chance of spreading infection are to wash hands frequently, cover your cough or sneeze, and try to stay healthy through proper exercise, diet, and rest. Most cases of viral meningitis occur in the young. 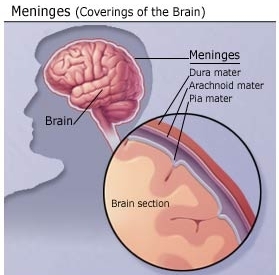 In the past, bacterial meningitis also affected the young, but the last few decades, as a result of protection caused by routine childhood vaccinations, the average age at which bacterial meningitis is diagnosed changed from 16 months to 25 years. – In infants: poor feeding, constant crying, and excessive sleepiness or irritability. The most important test for diagnosing meningitis is the spinal tap. This procedure brings up some dreaded images for most people. In the hands of a competent experienced physician, a spinal tap is relatively painless. Other than a possible temporary headache, there are usually only rare complications from a spinal tap. This is the only way to confirm the diagnosis of meningitis and to help guide the treatment of this disease. Of special note is a type of bacterial meningitis caused by the germ called meningococcus. This also spreads from an upper respiratory infection entering the bloodstream. This is very contagious and mostly affects college students living in dormitories. It also can be found at boarding schools and military bases. Pediatricians recommend that all children between the ages of 11 through 18 should receive the meningococcal vaccine to prevent this serious infection.